Need inspiration? Work somewhere inspiring. Recognised as one of the best coworking spaces in Singapore, The Great Room is thoughtfully designed to increase casual collisions and heighten productivity, each site is created by a hospitality designer to achieve the same elevated environment with sleek, sumptuous surrounds and perfect lighting. So much more than merely a place to get a job done, The Great Room will enrich the way you work and socialise. Known for our hospitality-inspired design and drawing inspiration from the best hotel lobbies, we create beautiful and highly functional spaces that are conducive for ideas and innovation to thrive. The flattering lighting, decor, rich colour palette and furnishings make you feel you are somewhere special, and that you are someone special. With touches of hospitality, we change the way you feel about work. Banish Monday blues as we kick off the week with Monday Breakfast Club, a sumptuous breakfast gathering where members exchange ideas over a fresh cuppa brewed by our in-house barista. In the evening, a turndown cart comes round with warm cookies and hot chocolate, all in bid to end Monday on a sweet note. Great design attracts a like-minded community and our community is the beating heart of The Great Room. We are a community of leading entrepreneurs, ‘grown up’ startups and corporates, every member contributes to an environment that is open, inspiring and dynamic. We offer a range of membership options with something from the menu that’s sure to suit your requirements. Whether you’re a fast-growing company in need of an entire floor, or a dynamic entrepreneur on the lookout for the perfect hot-desking environment, our plans cater to your unique specifications – and they’re flexible enough to guarantee you find the membership that suits you best. If your flourishing business requires a little more space, there’s a range of dedicated workspaces from two-person rooms to entire offices equipped for companies of twenty or more. Grab a seat in the lounge or workhall and you’re ready to work. 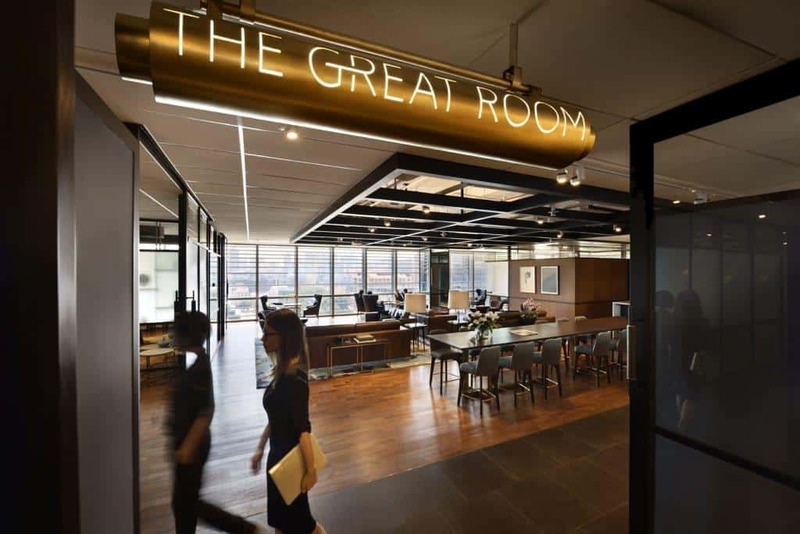 The Great Room redefines Hot Desking with beautiful interiors, a dynamic ecosystem of businesses and access to locations across Asia’s gateway cities. If you’re in need of a temporary bolthole in the city, we offer the opportunity to use our spaces and services for a single day. For individuals who may not require an office space, but would like to be part of the community and benefit from the network and elegantly designed spaces. Conveniently situated in the prime Central Business District, and a short walk to Raffles Place, Clarke Quay and Chinatown MRT stations. It’s in a vibrant neighbourhood with trendy restaurants, bars and wellness facilities. A premier workspace in a national monument that looks out over an urban oasis courtyard and surrounded by heritage colonnades. Within walking distance to Esplanade, City Hall, and Bugis MRT stations. Located in the Central Business District in the zone of Marina Centre, The Great Room occupies 36,000 sqft over 2 floors, with gorgeous views and natural light. It is a 1 min walk from Promenade MRT station and 10 minutes from Esplanade MRT station. A modern workspace right in the heart of Orchard road and conveniently located directly above the Orchard MRT station. A stone’s throw from 7 floors of shopping and gastronomical delights, a gym, cinema and cooking studio.